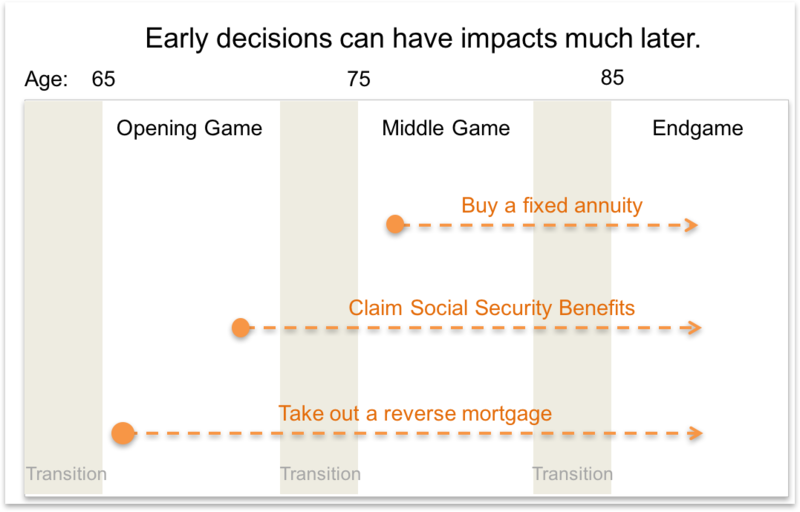 Although many retirement planners frame retirement planning as a single “game” (buy an annuity, claim Social Security benefits late as you can and don't spend more than 4% of your savings annually), planning is better framed as a chess game with an opening, a middle game, and an endgame. The risks are different in each of these games, as are the opportunities for income and the costs. Our level of physical activity declines over time. Airlines report that Americans stop most international travel by their early seventies and most domestic flights by their early eighties. Retirement has an opening, a middle game and an endgame. Plan accordingly. Mental acuity may differ significantly in each game. Our interests and our family structures change with time as does, of course, our remaining median life expectancy. Our savings may grow as we hope they will, or they may shrink as we age. These key characteristics of retirement finance change as retirement progresses and create what are essentially distinct phases – early retirement, mid-retirement and late retirement – that require unique strategies. A single retirement finance strategy is unlikely to be optimal in all three stages. Because we can't predict the future with any accuracy we won't be able to establish these strategies firmly until we reach the transition periods preceding them. We can, however, “pencil in” our best guess for now and change our plans as warranted. To complicate planning, some important decisions must be made in early retirement whose impacts won't be felt until later stages. We have to decide by age 70 at the latest, for example, when to claim Social Security benefits. That decision's results may not be felt until late retirement but the decision itself must be made in early retirement. We won't be able to postpone the decision to purchase a fixed annuity forever, either. At some point they will no longer make sense. One has to medically qualify for Long-Term Care insurance and this is harder to do than most people think. Postpone the decision to purchase LTC insurance for too long and you might no longer qualify. The results of a decision to borrow a reverse mortgage early in retirement instead of postponing spending home equity may likewise not be felt until late retirement. So, while it would be ideal to make all mid-retirement or late retirement strategy choices just before we reach those stages, a few will already be set in stone by then. One of the counterintuitive things I learned as a business executive was "Don't make a decision until you have to." That sounded like procrastination, but it isn't procrastination because sometimes you have to make a decision quickly. At other times, postponing a decision as long as you can allows you to gather new, relevant information that affects the decision and moving too quickly just means you make that decision without all the information you might have had. It's better to postpone a decision to cross a street, for example, until you reach the intersection and assess the situation. Various retirement decisions have different deadlines. You will have to make a Social Security claiming decision by age 70 to maximize lifetime benefits. On the other hand, you don't have to decide at age 65 what your asset allocation will be if and when you reach age 95. There is no advantage to locking in your age-95 asset allocation at age 65, in fact there is a disadvantage. Plan in three separate stages because each of the three games is significantly different from the other two and requires its own strategy. Plan your complete retirement future "in pencil" with the best guesses you and your planner can make about future stages. But, understand that this plan is a work-in-progress that will need to be changed over time as your financial situation changes. Initially, develop plans for future stages that will work under a broad range of conditions because you cannot predict what your financial situation will be when you reach them. Refine those plans as you age and your likely future scenarios begin to come into better focus. Postpone most decisions as long as you can. These include decisions like asset allocations and spending rates that can and probably should change annually, reverse mortgages, fixed annuity purchases and claiming Social Security benefits. At the same time, be aware that some decisions have an "expiration date." Postpone purchasing LTC insurance too long and you may no longer qualify medically. Pay particular attention to decisions you must make in early stages that may have a large impact on later stages. Claiming Social Security benefits is an excellent example. As you approach the transition to each new stage – including the first – review and revise your retirement plan to reflect the financial situation in which you find yourself. Assume you will reach the endgame. I'll talk more about these three games in future posts, beginning with The Opening. Be aware that if you have a high-deductible health insurance plan and will claim Medicare in 2017 your HSA eligibility will end when your Medicare coverage begins. That means you will likely need to pro-rate your 2017 contribution to avoid tax and a penalty . Also, be aware that Obamacare allows you to cover a child on your own health insurance policy until he/she reaches age 26, but they cannot be covered by a Health Savings Account (HSA) unless you can claim them as a dependent on your Federal tax return. If either of these applies to you, contact your tax preparer before making this year's HSA contribution. Medicare.gov What happens to my HSA when I sign up for Medicare? You can expand the chess analogy to your entire financial lifespan. The opening is usually pre-determined within a number of well-known openings where up to 7-10 moves have been well studied over generations. So those can go pretty fast if both players play conventional lines. This leaves time on the clock for heavy thought in the complex middle game which is where much of the unique play in a match occurs. So somebody starting out now has the tools to quickly assess a percentage savings rate for retirement, home down payment etc. and has simple, diversified tools such as TD funds to use until they have substantial assets. In middle age, there is a lot of complexity like the middle game, where kids, jobs, homes, business and stock market cycles etc. all combine to create a wide array of financial situations that require real thought and effort to optimize. In many cases, luck is your primary opponent where a good business cycle etc. can set you up well for a good transition to the end game and bad luck can torpedo you at a critical time. By retirement, the financial situation becomes clearer with fewer options to move forward with, like in the end game. If you only have $100k of savings at age 60, it is unlikely you will have $2 million at 65. While there are opportunities for creativity in the end game, it is usually driven by math on how many pieces you have and where they are. That is why good players will resign 10 moves or more before a sure loss because the result is a foregone conclusion. 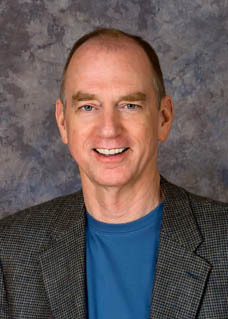 So you have the opportunity in the transition of the middle game to the end game (age 55-70) to make moves to position yourself as well as you can for the end game, but if that queen sacrifice in the middle game didn't pan out quickly, your pieces are probably well outnumbered and you will have to live with the results. For much of the population, the question about whether or not they can defer Social Security to age 70 has already been answered in the negative by age 60. Excellent comment! Now, if we could only get 25-year olds to read it. I would only note that while one can resign and move on to the next game in chess with a reset board, we have to "live with the results" in retirement good or bad and play out the game. When we enter the retirement game we have to make the best possible use of whatever pieces we have left. This is too good to publish anonymously, by the way. "Postpone most decisions as long as you can. These include decisions like... reverse mortgages..."
Postponement of the RM decision exposes one to all manner of risk - interest rate risk, home value risk, ability to qualify risk and program change risk to name the most significant. I would suggest that the more appropriate course - unless one's financial position is such that there is absolutely NO POSSIBILITY of ever needing to tap one's housing wealth - is to make the decision to GET an RM line of credit as early in the game as possible, but postpone USE OF THE FUNDS as long as you can. For the up-front cost equivalent of a single year's LTCi premium for most folks, one can ensure access to one's housing wealth for one's lifetime in that particular home. This includes IMMEDIATE liquidity upon a decision to sell, and does NOT include any requirement that the liquidity in fact be tapped at all. Postponement of the RM decision may easily result in that option being taken off the table entirely. When I suggest postponing the Reverse Mortgage decision I am referring to actually borrowing from the loan, not the decision to open one. It may well be a good time to open a loan with the intent of spending the money later in retirement, given historically low interest rates and motivated RM lenders. That is, in fact, what I am doing. I would add, however, that there are a few issues that have given me second thoughts. First, I have been trying to open a loan for months and it has not been a smooth process. An economist friend has had similar problems with lenders insisting that she make extensive improvements to qualify for the loan. Second, I am not happy that I will have a title to my home that is encumbered by the RM, though I ultimately decided I could live with that. Lastly, borrowers who are tempted to borrow early in retirement despite their best intentions could be putting themselves at risk of needing the funds even more later in retirement. But, in general, I agree that opening a loan and not borrowing from it until later in retirement is probably OK.
One of the counterintuitive things I learned as a business executive was "Don't make a decision until you have to." That is all that there is to it. White Coat Investor suggests the "Taylor Larimore method of retirement spending. He says he basically looks at what he has each year, looks at how it did over the last year, and then decides how much to spend." All formula approaches, even when adding Kitces "age-banding" rules, are nonsense. The Taylor decision process makes the most sense, but ONLY IF you have assembled and continually update all available relevant and material facts in order to make those decisions. John, I'd probably say that's "a lot of it" rather than "all there is to it." To the extent that a retiree has built a secure floor there is less need to "look around to see how much he has" annually. His income is pretty predictable. A retiree whose expenses are completely covered by Social Security benefits, pensions and annuities wouldn't need to re-evaluate annually to the same extent. It sounds like you are referring more to those retirees who choose to fund retirement largely from a volatile portfolio of investments. For those I completely agree with Larimore. "Dynamic" or "variable" spending is the only rational approach when spending comes from a volatile portfolio. Still, spending is only one piece of a retirement plan and whether the income source is secure or volatile, the retiree needs to keep it within the scope of the overall plan. Planning one year at a time isn't something I'd recommend. Yeah, but the relevant and material information that I mention must include an ongoing thorough knowledge of possible negative scenarios, and a plan to deal with those. Does the retiree really need the secure floor? In most cases wait-and-see, with a backup plan, is the better way to go. In any event, no formula approaches. Most economists, the vast majority of the top retirement researchers I know, and I would say "Yes, you really need a floor." Dirk, just watched your interview w/boomerincomeideas.Did you ever have that follow up discussion on ideas of increasing returns on your nest egg? Great blog you have. Thanks. I'm not sure which discussion you are referring to. Are you referring to that interview?